When contemplating offering Macs to your workforce, the question of cost inevitably comes up. “Macs are great, but I can buy two PCs for the same price as one Mac,” is a common mentality within IT departments. 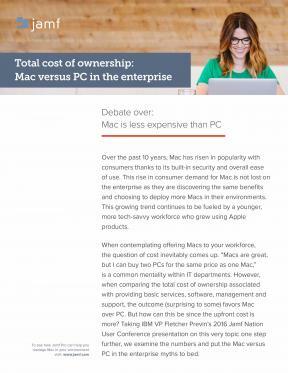 However, when comparing the total cost of ownership associated with providing basic services, software, management and support, the outcome (surprising to some) favors Mac over PC. But how can this be since the upfront cost is more? Download the PDF for answers.